The skills represented by Digital Credentials are the key to professional growth and opportunity. What are Labor Market Insights? Labor Market Insights, available on Credly's Acclaim Platform, are for badge earners and issuers to find and surface jobs and career opportunities by title, location, employer, and salary range. Are the Job Postings Active? Yes. Data is sourced from more than 25,000 global job boards and corporate career sites, the US Census Bureau, and The Bureau of Labor Statistics. Labor Market Insights on Credly’s Acclaim Platform are updated 24/7 so that only active postings are displayed. How Can I Get Access to Labor Market Insights? They're available to everyone on Credly's Acclaim Platform. 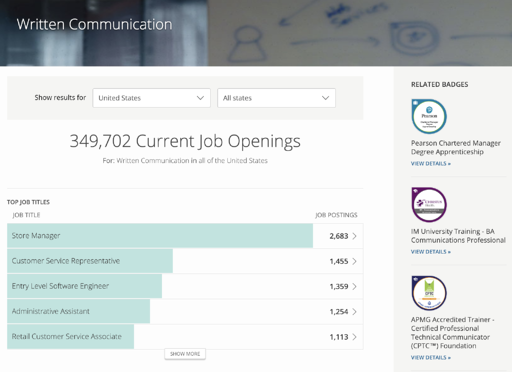 Look for "Related Jobs" on any credential page, then use search and filter to refine the results and find opportunities.